Author Amp is a marketing and PR agency for authors who want to increase the exposure of their book. 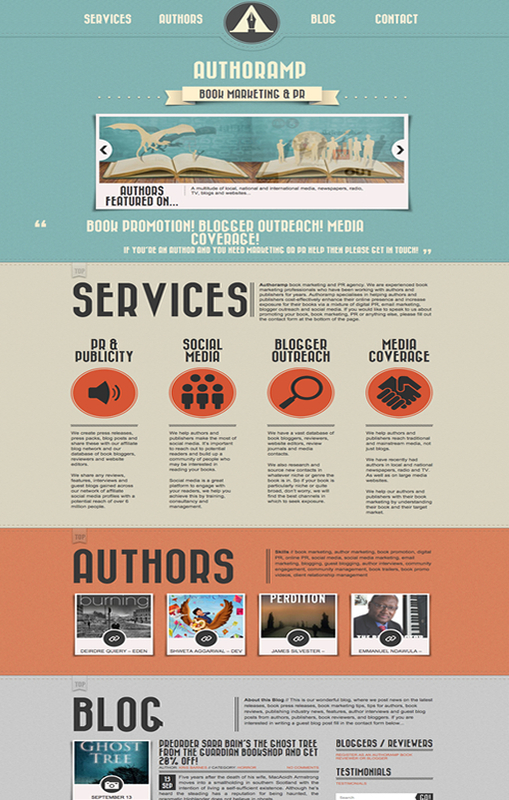 The author web design promotes books through their website as well as through email, social media, and PR channels. The author web design is built on WordPress and makes use of the Retro theme. The header with the banner and quotes really has an impact on the visitor as they first hit the website. The colours and bold font really make the content stand out and guides the visitor successfully through the website. This is a one page theme but it has a built in blog that is heavily used by the administrator to promote authors they are working with as well as interesting articles. We setup the theme and all of the initial content. We helped to source the right images and set the perfect colours for the web site. We also setup all the latest security on the website and made it SEO ready. The one page theme is broken into sections that work really well for the author web design. It allows the admin to showcase the books and authors they are currently working with, as well as latest posts and a very prominent contact form. Having a large contact form at the bottom of the page really works well for conversions, especially after a lot of rich content. This website works so well because there is a lot of content and it is clearly managed and updated regularly. This is something that we always advise our clients as Google likes fresh content for SEO. There is also nothing more off putting to a customer than content that has not been updated for months or years. This theme is particularly good since a lot of content can be added to the page without it seeming cluttered or messy. This author web design is clean, crisp and modern while appealing to look at and read.